Wendy's waffle article focused on the honeycomb indentations as the primary differentiator between waffles and pancakes, and that seems to be what makes waffles so much better because they can lock-in syrup and butter in each comb. Kamek's pancake article focused on the fluffiness and softness of the pancake, which I'm otherwise lead to believe are not characteristics one would associate with a waffle. Since no one has written otherwise, I'm lead to believe that waffles are mean and coarse. This actually goes into what Stacey Abrams was saying about how the waffle's indentations are analogous to President Donald John Trump building border WALLS and putting immigrant children in cages, and how that cruelty doesn't comply with the fluffiness of the United States of America. After all, honey (or microscopic people) inside an indented comb can't get out and go into other parts of the waffle. Definitely cage-esque, and the border WALLS of the comb are also preventing them from entering the other parts. The analogy works perfectly. That said, I'm also for the WALL. (Despite my heavy sarcasm during the Republican presidential campaign regarding the topic of the WALL.) Therefore, I see this as a net-plus for the waffle, which should perhaps be named the WALLfe. Even if I'm a big fan of fluffiness and softness. Rawk had this point about the Waffle House and culture, and he made the Waffle House out to be a nice place during breakfast time and a terrible place at night. 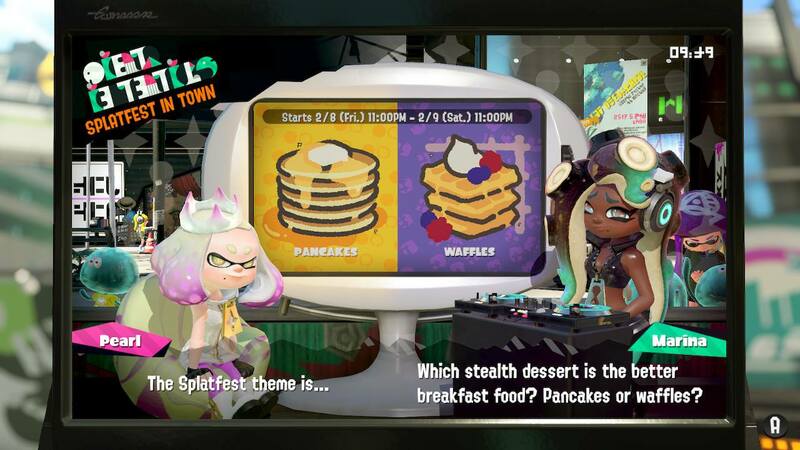 That said, the Splatfest clearly asks about the waffle's place as a breakfast food, so whatever happens at night isn't canon to the question. Meanwhile, border security obviously affects people's breakfasts. I have an actual issue with pancakes. You see, there is a phrase that goes along the lines of “flattened into/like a pancake.” It's used after jerks like Mario use their shoes to stomp on someone's head so hard that it deforms their body structure, making them flat. Like a pancake. OW! This is what pancakes are all about! No one says flattened into a waffle. You can even see that Mario personally endorses pancakes. 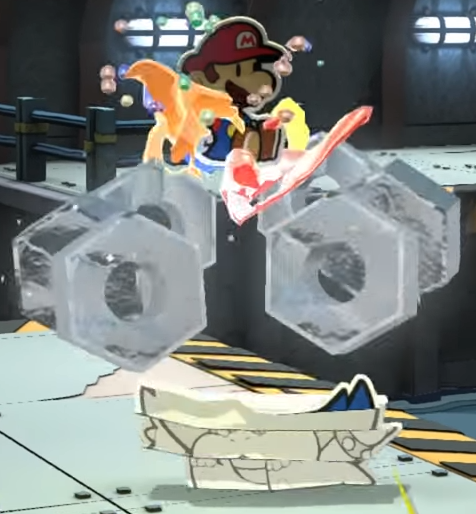 Mario flipping a pancake in an animation made by LINE. The only reference to waffles is in Luigi's imagination (the Waffle Kingdom ain't even real), so I'm going to say that's distant enough of a relationship that I feel pretty safe endorsing TEAM WAFFLES for this Splatfest. For our safety and freedom from oppression. Ludwig still isn't going to try to eat any waffles or pancakes for this Splatfest, since their gluten-free versions aren't good. They sort of need to be made of wheat due to wheat's unique properties that the alternative gluten-free ingredients just don't have. One is better off just having syrup directly off a spoon...which Ludwig might end up doing. He does love spoons, after all. The Splatfest before this was Family vs. Friends, where Ludwig sided with Family. How about the Splatfest after? That's Knights vs. Wizards, and Ludwig is pro-Knight. ...What? For the victory of Team Waffles I present you a picture of Marina near Pokéball waffles. https://twitter.com/ShinyGirafarig/status/1094589532425601024 I posted it hours before results were revealed not knowing if they would win or not and doing a usual "in before" comment in case Team pancakes would taunt me. Thankfully they did not. The Splatfest inspired me to order the waffle maker. And I am setting up a date to make the homemade salsa. I have off from work President's Day and can leave my daughter by the babysitter so I can finally devote time for that too. Yay, you're getting your backlog of foodstuffs done too. I'm really happy that we collectively called the Splatfest correctly on KoopaTV after dedicating literally a whole week to it. Would've been bad otherwise. We probably will get that Pearl vs Marina Splatfest to find out who will be the glorified tutorial giver in the glorified tutorial mode called Hero Mode 3 for Splatoon 3. I still gonna come up with an opinion about when we'll see a Splatoon 3...! Wouldn't surprise me if it was still Marie by then, though! While I was waiting for a round to start, I just happened to see your name flash across the screen for winning a 10x battle and I was glad to know that you joined the superior team. Even though you do not have a preference of either choice due to your disease, you still made the right decision in the end. I just hope that the next Splatfest will be something more interesting and not food related. This Splatfest was apparently interesting enough that the other staffers all ('cept Witchy) did stuff for it. You don't see that for the other ones.